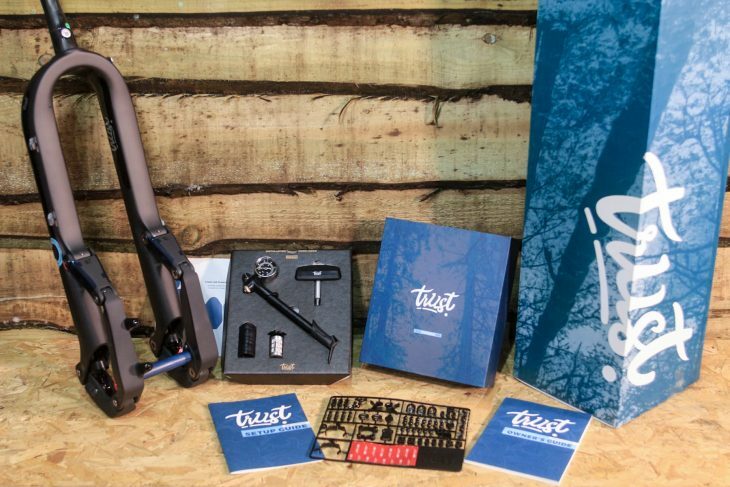 The Trust Performance Message MTB fork is quite unlike any other fork currently on the market and is unique, even among linkage forks, with its dual air spring and thru shaft damper system. Singletrack contributor Fahzure Freeride took the Message to Suspension Syndicate, a custom suspension tuner in Salt Lake City, to teardown the Message fork (or, “chassis” as Trust prefers) and look at some of the unique solutions embodied in the design. The chassis comprises the tuning fork carbon structure from steer tube end through the taper into the legs and all the way to the chassis tips, where it connects to the shock link which drives an air can (left) or an air can and damper (right), housed in a chassis leg. The shock link, in turn, connects to the axle link which, on the left side, also has the brake post mount. Mounted at the top of the axle link, the control link creates the arcing path for the axle as it collapses. The chassis is a bladder molded unit with five ports and a complex shape, while the link pieces are compression molded around rigid sacrificial cores, with all of the fork elements designed with the assistance of AI like processes to optimise final shapes and layups. The pivot system is unique for forks, featuring common sized, yet custom, stainless bearings, hollow aluminum axles, cotter pin safety retainers and exterior shields (for those pressure wash types). Simple bottom and top bolts (though in different spots on each leg) enable removal of the air spring and air spring damper units, which Trust has available as complete units and with custom tuning for quickly swappable adjustments. Trust also supplies tokens for its air cans, which it describes as having a very linear base rate due to the large negative chamber. However, with a large bottom out bumper and and stroke rate of about 3:1 the linkage has a progressive rate, combining to ramp the fork up substantially at the end of stroke. The damping system and approach are unique. The right-side mounted 8mm thru shaft damper is low friction/hysteresis and supports a low-speed rebound and a 3-way ride mode (lockout) switch actuated at the top of the right leg. 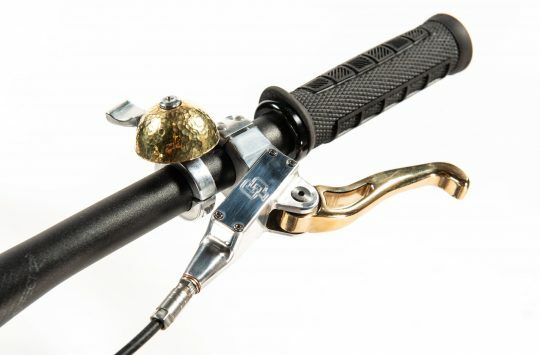 Like a radio controlled car mechanism, the lockout lever turns a 120mm-ish drive shaft with a pinion gear on the end (about mid leg) which, in turn, actuates a gear connected to the valve which switches between the three ride modes: open, medium and firm. The medium and firm base low speed compression settings are additionally adjustable via allen headed valves, accessible in the middle of the right chassis leg. We found the assembly, fit and adjustment mechanisms on the Message to be well executed, especially the links and chassis which, despite the numerous pieces and many ports – all requiring precise alignment and shape – were very well executed. In moving the unsprung fork through its stroke, it was clear that the fork required less effort to move than a comparable telescoping fork, though the overall force was not obviously “substantially reduced” as claimed, perhaps because of the effects of the base damping. The chassis, bearings and links all appeared quite rigid and the torque cap compatible thru axle only adds to that lateral stability. Plenty of extras in the box. The fork includes all kinds of housing routing guides, clear protective tape, a handy torque allen key, integrated sag indicator and a somewhat confusing owners’ manual, all of which make it appealing to early adopters looking to get that first press box set feel. 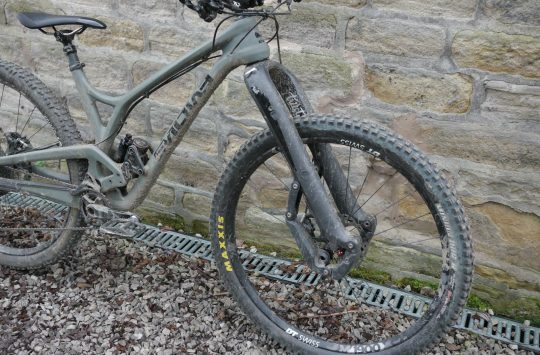 While the Message lacks a certain amount of user tunability, it is well constructed, despite the many precision and unique challenges inherent in a fork that operates with a complex suspension movement, more like many bike frames. 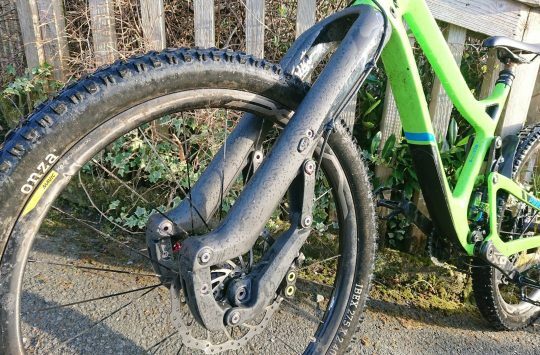 With a simplified damper system, dual air cans, well sealed bearings and high quality carbon structure, the mechanics of the fork would appear to make it reliable and reactive. Judgement day – our final review. Looking forward to a peep at how complex it actually is. Just watched, looks well made, it will be interesting to see if they can tweak it to get a better response from testers. Surely a lot can be done by adjusting the different linklengths.